Do you like pure, natural and organic products? Do you prefer to support local farmers? Does eco-friendly packaging effect your choice of products? If you answered "yes" to any of the above, then you've come to the right place. 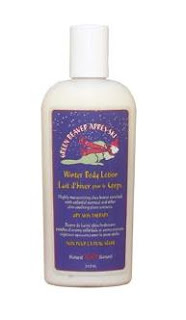 My friends, I have recently had the pleasure of sampling two great products from the Green Beaver Company: the Winter Body Lotion from their Après-Ski line and one of their newest products, their delicious Lip Shimmer. Founded in 2002 by biochemist Karen Clark and husband Alain Ménard, microbiologist, who were inspired by their son Joshua to develop safe, natural and eco-friendly personal care products. Located in Hawkesbury, Ontario, the Green Beaver Company distributes their products to hundreds of natural health stores all over Canada. Based on the Natural Living approach, they continue to introduce products made with organic Canadian ingredients that are edible, vegan and gluten-free, or ecologically wild-crafted from coast to coast. They do not use artificial, synthetic, chemical or petrol-derived ingredients, nor do they test their products on animals. Now on to the product review. .formulated to protect and relieve the driest, roughest and itchiest skin. The products are naturally rich with shea and cocoa butter for maximum hydration. Après-Ski products are enriched with skin soothing colloidal oatmeal and other nourishing plant extracts such as aloe. After a few minutes of applying some lotion on my terribly dry hands, I noticed they felt silky smooth and that the cracked skin on my knuckles felt soothed. I could also smell a nice medley of thyme, oregano and rosemary which kind of sent me into an herbal zen-like state. Don't laugh. It's true! It's like when I walk into natural or organic health stores. That's what the smell reminds me of. It makes me feel like sitting in the Lotus position, listen to a babbling brook, practice yoga breathing and focus on my Brow Chakra. What are some of the additional benefits of using these products? You reduce the use of pesticides and its residual effects. You encourage more Canadian farmers to go organic. You help to cut down pollution by going local. Just an FYI: not only do they have a couple of baby products on the market, I have also been informed that they will be coming out with a kids' line this summer. Yay! 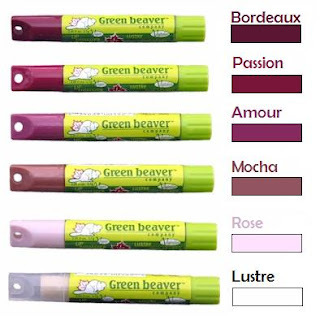 Visit the Green Beaver Company website for a list of retailers across Canada as well as some online stores that carry their products. For my Toronto readers, you've probably heard of the Big Carrot and yes, they carry Green Beaver! In my Google search, I came across Well.ca which sells a 240mL bottle of the winter body lotion for $12.99 and the mint-free Lip Shimmers for $5.89, and also offers free shipping within Canada with no minimum order! One lucky reader of Toronto Teacher Mom will receive one product from their Après-Ski line and one Lip Shimmer. Check out their winter skin care tips and tell me something new that you learned. Contest ends February 8, 2010 at midnight EST. Open to Canadian residents only. Winner will be selected using Random.org and must reply to the notification email within 3 days or a new winner will be drawn. I was sent a bottle of Green Beaver Après-Ski Winter Body Lotion and a Lip Shimmer for the purpose of this review. I like their face products - Day Facial Moisturizer, Facial Exfoliant, Blemish Mousse, etc. The Winter Hand Balm sounds wonderful! I learned that Après-Ski products are enriched with skin soothing colloidal oatmeal and other nourishing plant extracts such as aloe. The Apres-Ski Hand Balm caught my interest - I could use something that would help my cracked hands. I'd definitely like to try their deoderant. I've been searching for a natural one that really works! The Winter Face Cream caught my interest. I learned that after washing, you should gently pat skin instead of rubbing it dry and that you should moisturize while your skin is still slightly damp to trap moisture in. A product that caught my interest was the AppleMint Bath and Body Lotion! "After washing, gently pat skin (don’t rub dry). Moisturize while skin is still slightly damp to trap moisture in." I am a follower of Toronto Teacher Mom using Google Friend Connect! I am a fan of Toronto Teacher Mom on facebook! I subscribe to Toronto Teacher Mom. I would like to try the Winter Hand Balm-my hands get so chapped with our Canadian winters. Good tip: Exfoliating allows a moisturizer to sink in deeper. The apple mint Shampoo and Conditioner looks great! Glad to see these Canadian products available throughout Ontario! I will have to try some out soon. Rejuvenating Cranberry Shampoo for dry, damaged or colour-treated hair sounds amazing! The haircare caught my eye as the shampoo and conditioner are gluten free!! I would like to try winter hand balm. With small kids we are constantly washing our hands to help combat spreading of germs. With Canadian winters we need it! I learned about what causes winter itch - I never knew what caused it before! With the harsh weather this year my hair has taken a beating so the Shine Enhancing Apple Mint Shampoo for dull-looking hair caught my eye.